Sweden from the Cheap Seats: Have You Any Matches? Joe Advent is here indeed, and you know what that means: giant straw goat time! Yes, our caprine friend has reappeared in Gävle, and this afternoon I hopped a train (it's only a 45 minute ride) to give him a quick visit, and to check out Gävle itself. Gävle has a reputation of being a cute little city, with a nice river running through it, and a well preserved old town full of brightly colored wooden houses. Due to the goat's influence on local tourism, they also pride themselves on being something of a Christmas-time destination. 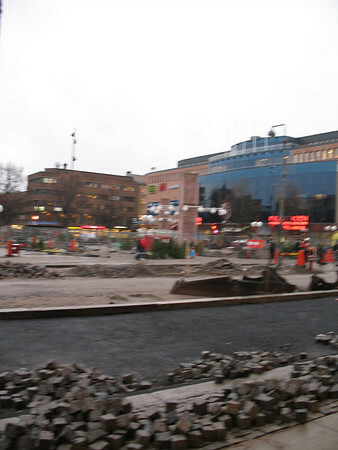 So it seemed like Gävle might be a cheerful place to spend yet another grim afternoon. I had forgotten, of course, that Gävle is in Sweden. Expecting tourists to come to your Julmarknad? Time to tear up every street and square in the downtown area! 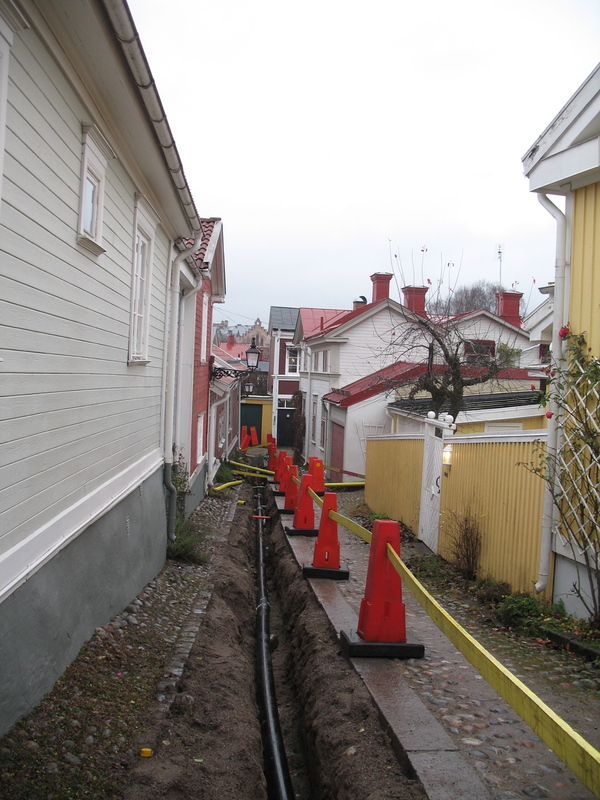 And while we're at it, better dig ditches over two-thirds of Gamla Gefle. Many people have asked that. The problem is that everyone wants a goat, so we cannot send them. You would have to beg someone to send you one. Actually, I was rather under the impression that I already was begging someone to send me one, namely her, but she seems to have thought that I should go and beg someone else. I am reminded of a story I once heard on "Wait, Wait, Don't Tell Me…": the cafeteria in a Swedish factory served very good food, so good that people who lived in the town started coming there for lunch, which made it hard for the employees to get their lunches. Instead of expanding the cafeteria, or opening an employees only eatery, the factory solved the problem by closing the cafeteria. That'll show 'em! 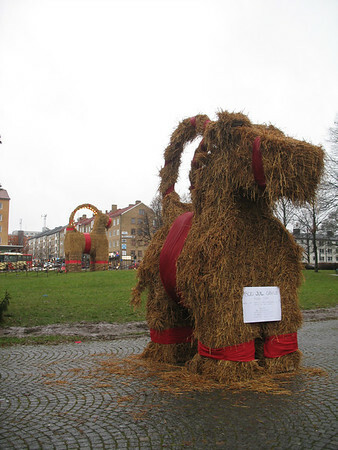 *Little known fact: there are actually two straw goats built each year in Gävle. In the 80s, the Merchant's Association got tired of dealing with the burning goat every year, and decided to stop building them. So a local student association built a goat for the townsfolk. They started small, but in a few years they were building the biggest goats yet (they still hold the world record). These days, the Merchants build (and promote) the big goat, and the students build the little one. There was a period of bad blood between the two goats for a while, but now they seem to happily co-exist. After all, who wouldn't love that adorable little guy?